Employees of the Chandigarh Administration and its boards and corporations are in for a windfall. Their salaries are going to rise substantially from April 1. The rise will vary between Rs 400 and 1,500, depending upon the status of the employee and also the fact if the employee occupies a government house or not. -Patiala highway in Nabha village in the wee hours today. Dreaded terrorist Jagtar Singh Hawara had told his accomplices not to put their lives at risk, as the cadres of his movement had drastically depleted. 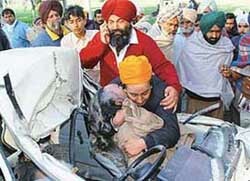 “Hawara had told Paramjit Singh Bheora, Jagtar Singh Tara and Dev Singh, while going to Sirhind in a car, not to risk their lives,” Baljit Kaur has reportedly told the police during interrogation. The Intelligence Wing of the police has been issued a list of persons by the Intelligence headquarters to keep a watch on following the Burail Jail break incidence. According to sources, the list includes names of those persons who have been directly or indirectly involved with the Babbar Khalsa International, a terrorist outfit of Punjab. The matter regarding the appointment of a Chief Engineer for Chandigarh is in its final stage. The future planning of about 2000 under construction flats in Sector 51, located just south of Sector 44, here has been hampered by an unauthorised slum colony and some illegal constructions. The Chandigarh Administration is at its wits’ end on how to lay underground sewer lines, storm water lines and water supply lines. 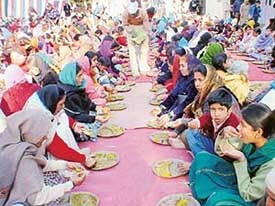 Recital of shabad and kirtan followed by langar marked the celebration of 627th birth anniversary of Guru Ravi Dass here today. A two-day conference of Rotary International District 3080 will be inaugurated by Mr I.D. Swamy, Union Minister of State for Home Affairs, at Shivalik Public School here tomorrow. Residents of Mani Majra should be prepared for a comparatively dry summer this year as far as availability of drinking water is concerned. The main reason being that at least four tubewells, to pump up underground water in the area, have dried up. The water level in a number of other wells has also gone down. The annual twin dog show will be organised by the Chandigarh Kennel Club on February 8, according to a press note here today. Organised in consonance with rules of the Kennel Club of India, the show is the most prestigious dog show in North India. The Shatabdi Purab committee here will organise a daylong Shatabdi gurmat samagam at the Phase VIII mela ground on February 8 to begin the year-long celebrations commemorating the 400 years of Guru Gobind Singh’s sons martyrdom. The counselling department of Vivek High School, Sector 38, here has developed a “Teachers Handbook to Learning Disorders”. The police arrested two students while stealing tyres from the Sector 5 market parking here yesterday. Now it will be possible for city graduates to pursue professional courses along with their mainstream subjects, thanks to a decision of the University Grants Commissions (UGC). The annual nursery rhyme and song day was a big affair at Eurokids, a playway school, in Sector 9 here today. Tinytots presented various rhymes and songs. The annual contest is intended to explore the talent of children, the school Prinicipal, Ms Mona Verma, said. 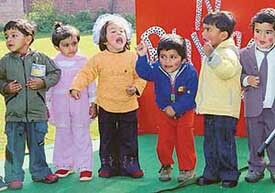 Tiny tots of Eurokids, Panchkula, celebrate ‘Song-n-Rhyme Day’ on the school premises on Friday. The three-member team from the National Assessment and Accreditation Council (NAAC) started its two-day visit to the Government College, Mohali, today. The team is here to assess the college in accordance with the University Grants Commission (UGC) guidelines. Shivalik Public School has bagged the first prize for a drama, “Where We Are Heading To?”, at the Inter-School Science Drama Competition, organised by the State Institute of Science Education, Punjab. The drama has also been selected for the Zonal Science Drama Competition to be held on January 28 and 29 at the National Science Centre, Pragati Maidan, New Delhi. FOR net savvy yuppies, as well as the oldies of the city, their daily exercise regimens is fast emerging as a must-do for socialising. Be it the walk at the lake, pumping iron at the gym or club, these places are fast emerging as the microcosm of city life. The city has always been famous for its “healthy body syndrome”. 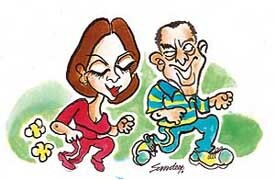 For years, the evenings, especially of “babus”, their political bosses and the latter’s patrons from the business community have revolved around jogging/brisk walk at the lake, Leisure Valley or Terrace Garden. HANDICRAFT and handloom products from Andhra Pradesh and North-East are on display at two separate exhibitions halls in the city. 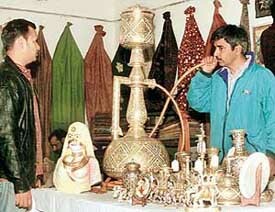 While the North-East Handicrafts and Handloom Corporation has roped in about 25 artisans from the region to put together an impressive handicraft show at Lajpat Rai Bhavan in Sector 15, Le Pakshi Handicrafts Emporium of the Andhra Pradesh Handicraft Division is organising an impressive show of its wares at Panchayat Bhavan. 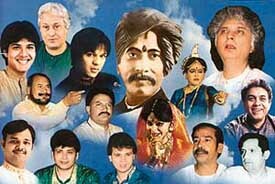 CELEBRATED exponents of Indian classical music and dance will participate in the four-day Bhaskar Rao Sammelan, which will begin in Chandigarh from February 13. Organised annually by Pracheen Kala Kendra, Sector 35, the concert, this year, will be progress on two locations. A three-day exhibition of home appliances, sound systems and air-conditioners started at the Aroma hotel today. All major international brands, including LG, IFB, Electrolux, Whirlpool, Sony, Haier, National Panasonic, Fujitsu, Denon, Jamo, Philips and Black and Decker, are participating in the exhibition, which will remain open from 10 a.m. to 8 p.m. till Sunday. DOGS are omnivorous. So if you think that by feeding your dog a chunk of meat, or giving it a part of your own meal, you have taken care of your pet’s nutritional requirement, here is a piece of advice coming your way. Give your dog a wholesome meal from which it can derive all nutrients. To help patients suffering from blood cancer, doctors have stressed the need for starting a bone marrow transplant donor programme in India, for which they are getting in touch with medical institutes in the US and Canada. Ophthalmologists have stressed the need for incorporating special eyecare programme for AIDS patients as more and more stand the risk of losing vision. The 16th Senior National Circle Kabaddi Tournament began here today at Football Stadium, Sector 17. In the match held in women section, Madhya Pradesh defeated Gujarat 36-26. For MP, it was Malti Kadia, Sangeeta Bhaduria and Rinki Pal who proved to be best raiders. For Gujarat, Sonal Patel and Meenu Patel scored seven and five points, respectively. The UT junior volleyball team, which brought laurels to city by winning the national junior title few days back at Kolkata, was felicitated today by the UT Administrator, Justice O.P. Verma. 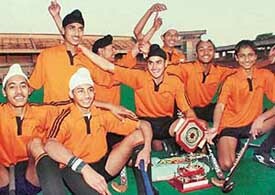 At a simple function held at Punjab Raj Bhavan, Justice Verma lauded the role of young boys in bringing home this coveted title which it won for the first time. The qualifying rounds of the International Tennis Federation (ITF) Junior Circuit World Ranking Tennis Tournament will begin here tomorrow at the CLTA Tennis Stadium, Sector 10. The main draw matches would begin from February 9. Players from more than 25 countries will participate in the tournament. The Municipal Corporation has written to the UT Administration seeking details of grant-in-aid that it will receive in the forthcoming financial year, reliable sources said here yesterday. The proposed site for a shopping mall in Sector 44D will be auctioned on February 27. The Chandigarh Administration will also auction 40 commercial, 40 residential and three sites for nursing homes.